The national nonprofit Active Minds has a presence on more than 600 high school and college campuses, empowering students to increase knowledge about mental health among their peers. We want everyone to know that mental illness is treatable, suicide is preventable, and help is available. In a landmark study, new research finds that the presence of the national nonprofit Active Minds on college campuses could significantly increase the number of students who receive help for mental health issues that could otherwise have serious, lasting, and sometimes tragic consequences. The longitudinal study of more than 1,100 students at 12 colleges finds that as students become more involved with Active Minds, they are more likely to reach out to a classmate or friend who is struggling with a mental health issue such as depression, anxiety, or suicidal thoughts. Additionally, even basic familiarity with Active Minds among the general student body increases knowledge and positive attitudes about mental health, creating a more supportive campus climate and increasing the potential that students in distress will seek mental health services. “Active Minds and other student-run organizations aimed at teaching peers about mental health issues may be instrumental in shaping a more supportive climate toward mental health issues on college campuses -- even over the course of a single academic year,” said Dr. Bradley D. Stein, the study’s corresponding author and a senior physician scientist at RAND, a nonprofit research organization. Suicide is the second leading cause of death among college-age students. Recent studies estimate that up to 36% of college students are dealing with some form of serious mental health issue, yet only about a third receive treatment or support. Approximately 67% of students tell a friend they are feeling suicidal before telling anyone else. "We are constantly working to reduce the stigma that surrounds mental illness because we want everyone to know that mental illness is treatable, suicide is preventable, and help is available,” says Ashley Salazar, a student at California State University at Fullerton who participated in the study. “Active Minds empowers students and provides us with the resources to make our voices loud and clear." The Active Minds model for mental health education and suicide prevention was pioneered 15 years ago and now has a presence on more than 600 campuses. 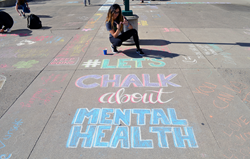 Active Minds’ public health, peer-to-peer approach focuses on equipping students to change mental health perceptions and behaviors and to help create an overall supportive campus climate. The findings suggest that Active Minds’ use of individual, small-group, and large-scale education programs meaningfully influences not only students’ knowledge and attitudes, but also their behaviors within a single academic year. “It appears that involvement in the types of activities conducted by Active Minds may translate into positive changes for many students,” said Lisa Sontag-Padilla, PhD, the study’s lead author and a behavioral social scientist at RAND. Support for the study was provided by the California Mental Health Services Authority. Other authors of the study are Michael Dunbar, Feifei Ye, Courtney Kase, and Rachana Seelam, all with RAND; Rebecca Fein with Active Minds; and Sara Abelson with the University of Michigan. To learn more about this research and what you can do for mental health awareness and suicide prevention, go to activeminds.org/study or connect with us on Twitter at https://twitter.com/Active_Minds.